Observed on the full moon day in the Hindu month of Ashwin (September – October), Sharad Purnima is of great significance to Krishna Devotees. Sharad Purnima 2019 date is October 13 as per traditional Hindu lunar calendar – India Standard Time. 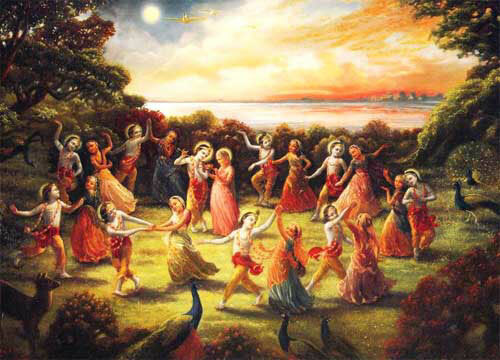 Sri Krishna, Radha, and Gopis of Vrindavan performed Ras Lila on the Sharad Poonam day. Yet another importance of the day is that moon is closest to earth on the day. Chandra, the moon god, is associated with herbs and medicine in Hinduism. The showering of Bhakti Raas on the Sharad Purnima night by Krishna on Gopis and Radha has been the main theme for poets and philosophers and still continues to attract the fantasies of common man. The Sharad Purnima night is also seen as the night of love and couples come out at night to face the moon and express their love. Sharad Poornima is of great significance in Mathura, Braj, Vrindavan, and Nathdwara. The day is observed as Kaumudi Puja – Koumdui Utsav and as Navanna Purnima.